03. Disrupt - "Sega Beats"
04. Dub Syndicate - "Forever More"
05. Harmonic 313 - "Dirtbox"
06. King Tubby - "Psalms Of Drums"
07. 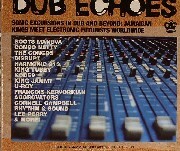 Kode9 & The Spaceape - "Sine Of The Dub"
08. Andre Suku Gray (Jammy's) - "Sign Rhythm"
09. U Roy & Francois Kervorkian - "Rootsman"
01. King Tubby & The Aggrovators - "Ruffer Version"
04. King Tubby & The Aggrovators - "Jah Jah Jehovah Version"
05. Digital Dubs vs Dubiterian - "Deb Dub"
06. The Congos - "Congo Man Chant"
07. Cotti - "Run Tings"
08. The Upsetters - "Rejoicing Skank"